The HP ProLiant ML110 Gen9 8-Bay SFF Tower Server is designed for reduced noise, performance, and the ability to expand over time. Focusing on easy expandability the HP ProLiant ML110 Gen9 meets the requirement for computing power on almost any level to help you Get IT Done! It is also an extremely cost efficient server with the initial cost to acquire being lower than most tower servers of its generation. This super scalable tower server can even be rack mounted using 4.5U of total cabinet space, making it an extremely versatile solution for SMBs and IT Professionals. The HP ProLiant ML110 Gen9 is a single processor server featuring the Intel Xeon E5-2600 v3 family of processors with a core count of up to 10 Cores and up to 3.0GHz in data processing rates. Memory can also be upgraded to up to 256GB across 8 DIMM Slots. The HP ProLiant ML110 Gen9 8-Bay SFF Tower Server comes with storage of up to 16TB and interface speeds of up to 12Gb/s. Giving both storage capacity and speed to meet the needs of even the most demanding applications! 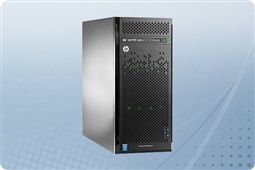 Aventis Systems carries New condition in all HP ProLiant ML110 Gen9 servers. All servers from Aventis System include a 3 year Comprehensive Warranty, with eligibility for optional Extended, Express, and Secure Drive Warranties as well as Onsite Services. So check out our 8 Bay SAS and SATA models below and find the perfect versatile and scalable HP ProLiant ML110 Gen9 to maximize your budget today!